"Our Rarer Monsters", a book of poems by Noel Sloboda, published by sunnyoutside press. 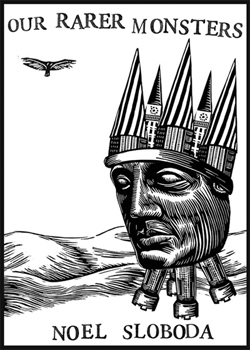 Marc Snyder created the artwork for the cover, and eight linocuts to accompany the poems. Follow the links to view the linocuts from this amazing book. Each linocut has been printed in an edition size of 30, and is for sale - see the linocut's individual page for availability. The linocuts are $65.00 each, plus $6 for shipping in the United States. Each linocut is printed by hand on archival BFK Rives paper, and is signed in pencil with the title, the edition number, the artist's signature, and the year. The image size is 5" x 7", and the paper size is 9" x 12". Please email me at marc(at)fimp.net if you are interested in purchasing a linocut. Payment can be made through paypal or a check. "Our Rarer Monsters" can be ordered directly from sunnyoutside press, or from amazon.com. It's a wonderful book, you really ought to treat yourself and buy it.